This version of the low voltage cable jointing and termination course is specifically made for working on dead cables only. Entry Requirements: Previous experience of working with low voltage cables required. Book your place on our Low Voltage Cable Jointing and Terminating course today by filling in our online booking form to the right, or by calling the team directly. Learn to both joint and terminate low voltage cables up to (and including) 1000V with this LV training course from PASS. The course will introduce you to the correct methods involved in the preparation of low voltage cables prior to jointing and/or termination. You will also learn how to correctly strip and prepare a cable, allowing you to install almost any joint or termination on cables by any manufacturer. Understand and demonstrate personal safety including the basics of onsite safety requirements, hand tools, resins and personal hygiene. Understand the basic principles and the use of test instruments including earth loop, insulation resistance tester and test lamps and evaluate results. Demonstrate test procedures for resistance, continuity, earth loop and polarity. Understand visual cable identification (cable depths, markers, tiles). Understand when they can work on damaged and/or faulty apparatus. Demonstrate they can strip cables. Demonstrate they can complete a single phase cut out including jointing instructions and procedures. Demonstrate they can complete a single phase sub service pot end. 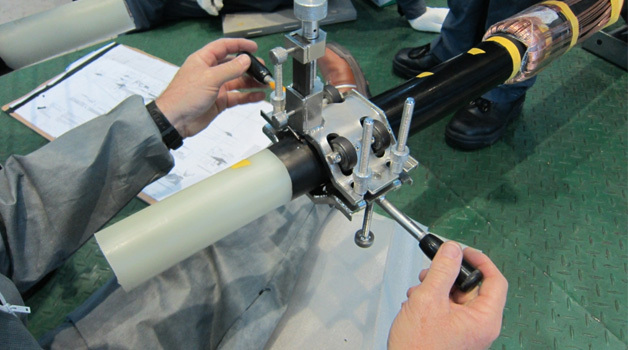 Demonstrate they can complete a single phase sub-service straight joint including jointing instructions and procedures. Demonstrate they can make cable ends safe. Demonstrate they can complete a single phase service joint on to three phase Wavecon mains. Please note that the practical content of this course may vary depending on material availability. Those who want to attend this course must have previous experience of working with low voltage cables. Candidates should be undertaking, or in the process of undertaking, a suitable electrical qualification. The course is ideally suited for jointer’s mates, electricians and those from similar disciplines who want to learn more about cable jointing and terminating on low voltage electrical cables. Any concerns about your suitability for this course? Give us a call directly and we’ll be happy to help. You will take part in both a written and practical examination as part of the low voltage cable jointing and terminating course.